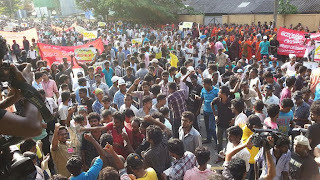 Sri Lanka's Major students Union, Inter University Students Federation (IUSF) “Anthare” has launched huge protest march today to pressurize the government to stop the students suppression and to protect the Free Education. 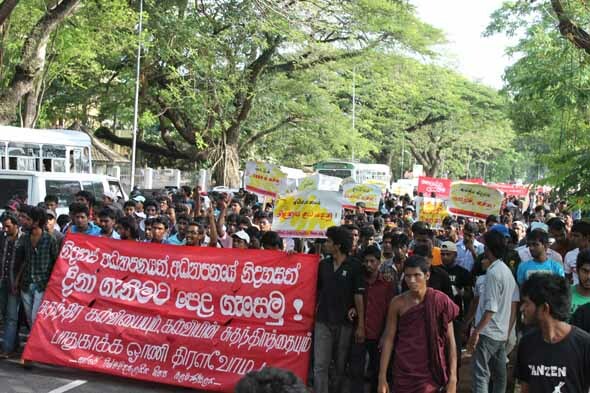 It is reported that over 10,000 students have joined with the today Protest March.Students have started their march from Japura University. 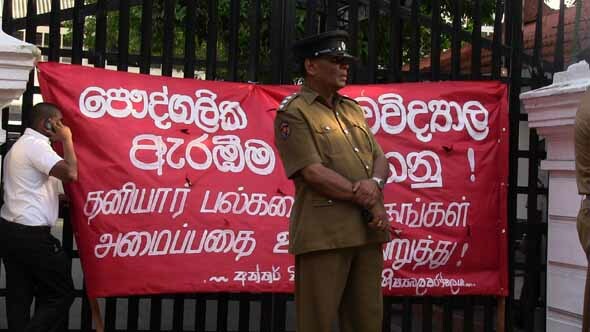 The motto was “Join to protect free Education and freedom of Education”. 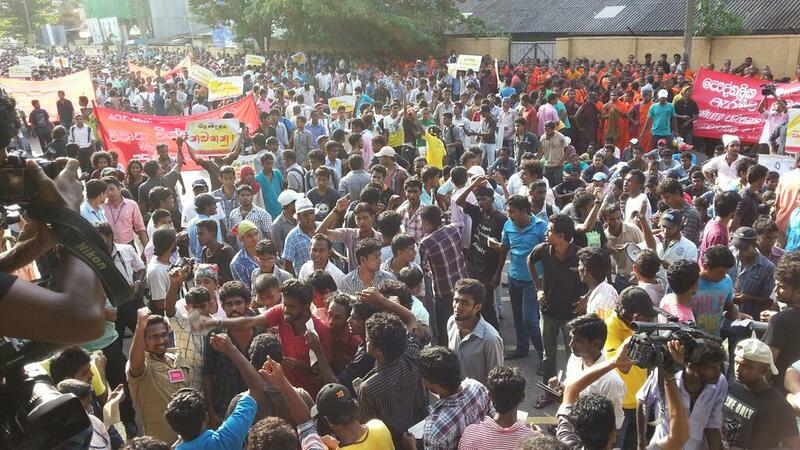 There was heavy traffic along the main roads and other roads in Colombo due to this protest. 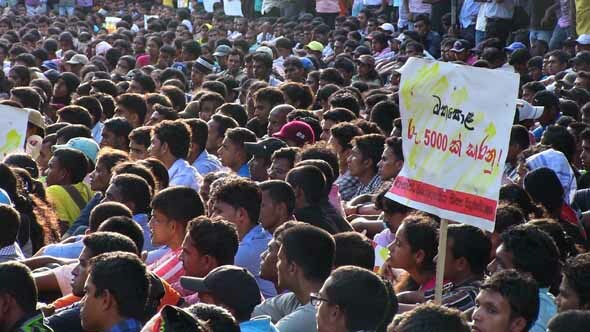 නිදහස් අධ්‍යාපනයත්, අධ්‍යාපනයේ නිදහසත් මූළික සටන්පාඨය කර ගනිමින් මෙන්ම වර්තමාන රාජපක්ෂ ආණ්ඩුව විසින් සිදු කරනු ලබන ශිෂ්‍ය මර්ධනය වහා නතර කරන ලෙස බල කරමින් දහස් ගණනක් විශ්ව විද්‍යාල සිසුන් ජයවර්ධනපුර විශ්ව විද්‍යාලයේ සිට කොළඹ විශ්ව විද්‍යාල ප්‍රතිපාදන කොමිෂන් සභාව වෙත විරෝධතා පාගමනක් පැවැත්වීය. 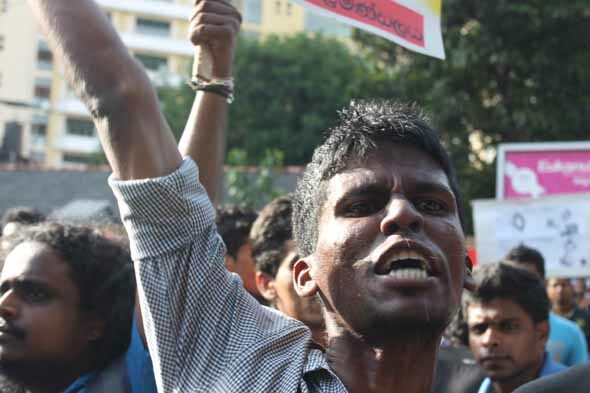 අන්තර් විශ්ව විද්‍යාල ශිෂ්‍ය බළමණ්ඩලය විසින් සංවිධානය කරන ලද මෙම විරෝධතාවය විශ්ව විද්‍යාල ප්‍රතිපාදන කොමිෂන් සභාව ඉදිරිපිට විශාල රැලියක් පැවැත් වූ අතර ඒහිදී ඔවුන් නිකුත් කර තබූ පත්‍රිකාවක මෙසේ සටහන් විය.